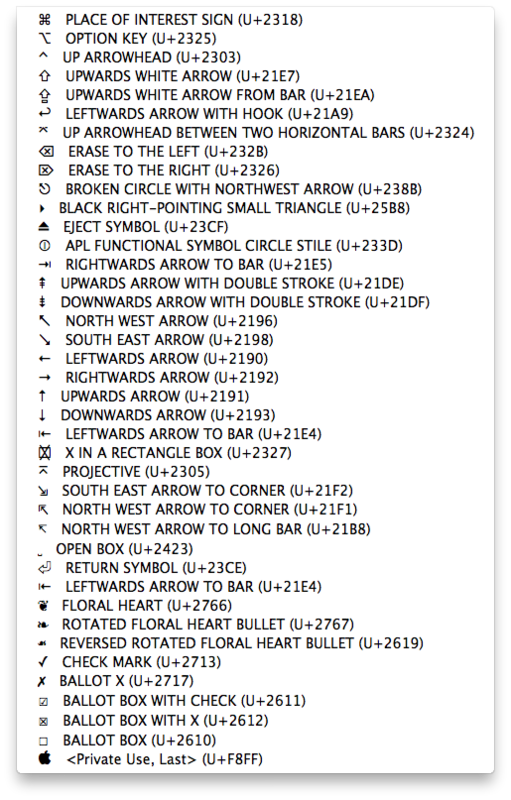 Illustrated are the correct Unicode code numbers for a variety of Mac keyboard related symbols. The easiest way to use these via a keyboard is to open System Preferences' International/Language section (name varies with OS version) and in the Input sources list tick the option for "Unicode Hex input"). Then with that input mode selected, type Opt+[number]. For example: Opt+2318 gives ⌘ (the Cmd key symbol). Or, to write them a HTML entity codes: ⌘. When switching input methods, don't forget when done to switch back to your normal language! Footnote: in most Mac fonts, Opt+Shift+K will insert the Apple logo, e.g. .